jaspervdj - Caching in Hakyll: Long live Data.Binary! Caching in Hakyll: Long live Data.Binary! Some experiences from trying to make Hakyll run faster. I explain some of the things I have tried, and some of the things that have failed, in the hope this could one day be helpful to other projects. Before you implement any caching measures in any program, you try to estimate what the speed gain will be. This is a heap profile from me generating this site from scratch (so after a ./hakyll clean). 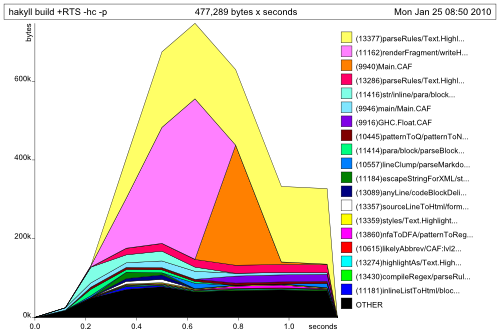 I am far from an expert at Haskell profiling, and this graph is a heap profile and not really a benchmark, but I think you can nonetheless see that the functions from Pandoc (seen here as the top yellow and pink blocks) are the “more heavy” ones. This makes sense, because rendering Pandoc markdown1 to html is not easy. The total time is under 2 seconds, but there are only a few blogposts on this site now. I’ve taken it to the test, copying a blogpost a hundred times, and the result was that the time taken rose linearly with the number of posts (hey, who would’ve expected that). The thing is that we can’t simply “make pandoc faster”. Pandoc is a marvelous piece of software, and probably quite optimized. What we can do is try to call Pandoc less. One “caching” technique used in Hakyll is simple timestamp checking. For example, the projects page on my website is created from two files: a projects.markdown file containing the content, and a default template templates/default.html containing the header and footer of this site. Now, Hakyll generates all of it’s files to the _site directory. So it will perform a trivial timestamp test, and if _site/projects.html exists, and is more recent than both projects.markdown and templates/default.html, we don’t have to generate it again. good: If we edit projects.markdown, only that file needs to be built again. bad: If we edit templates/default.html, all pages using this template need to be rebuilt. And as you can see, every page uses this template! This means that when we edit templates/default.html, we don’t have to render every markdown file anymore, we can just fetch it from the cache. Now, how will we implement this storing and fetching from the cache? It is not that easy to write it out in the same format. We need to watch out not to add --- lines in the html, or it will be read wrong when we fetch it from the cache. It is still pretty slow to parse, because we want to check for the different sections, like the sidebar in this example. I eagerly ran the test with a hundred blogposts again, waited and… well, to be fair, I didn’t even finish implementing this (I implemented a part of it, but it was still buggy). So, in short, this was a pretty bad idea: not easy to implement, and it was slow. I eagerly ran the test with a hundred blogposts again, waited and… nothing. Well, nearly nothing. I knew the automatic Read class is not that fast for large datatypes, but I hadn’t expected it to be so slow in this particular case. From 60 seconds3 without caching, it now took 58 seconds. Great, just great. But my options weren’t exhausted yet. I had recently read about the supposedly great Data.Binary library, so I thought I’d give it a try. I eagerly ran the test with a hundred blogposts again, waited and… profit! From previously taking 60 seconds, it now took only 15 seconds! Data.Binary rocks. I am now using it for a lot more than Pages: I also use it to cache tags and templates. But this shows the initial idea and how I got to try it out. I hope this blogpost encourages people to use it, it’s really worth the effort4.